Feel like royalty in these bold bright colors. Hot Pink that shimmers, Royal Blue that shimmers and our very sparkly Turquoise Kaleidoscope. 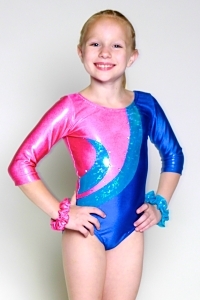 To top if all off add rhinestones to really sparkle at your next Gymnastics Competition! Do you love this design of this leotard but wish the fabrics were in a different color? Go to our Design Your Own section to mix-n-match the fabrics of your choice on this Danielle style leotard.